There is no rest for Connacht Rugby in their bid to achieve Champions Cup rugby this season. Still in the hunt in two competitions, they now return to Bordeaux where they became the first Irish team to win on French soil. Bordeaux-Begles is the opposition in this final pool three fixture [it was Begles-Bordeaux in 1996], and anything other than a win will see those ambitions restricted this season to the GuinnessPRO14. Last weekend Connacht achieved a first precious win over Sale to join them at the top of the table, and with all that hard work down, Connacht cannot afford to slip up in France on Saturday. Coach Andy Friend says there will be no hint of complacency. Connacht's task is simply to "do the job". "We know we need to win, we've done a lot of hard work to get here - Perpignan away, Sale at home, Bordeaux at home, Perpignan at home - and now we've got one more task, and we don't want to slip up on that," says Friend. "I have not looked at the permutations. All I know is we've got to win, and if we win, we are in the quarter-final. And once you get into that eight, does it really matter who you are playing? "You'd love a home game, and there are a couple of teams you would prefer to meet later on, but if you are going to win it, you have to beat the best that is there. We just know we have to get into that quarter-final, and whoever we face and wherever we face them, we will be ready." Friend is blessed with no new injuries, but could now be facing some selection headaches after Joe Schmidt's Ireland team announcement today. Not only are Bundee Aki and Ultan Dillane included in the squad for the opening two Six Nations fixtures, Schmidt has named outhalf Jack Carty, centre Tom Farrell and scrumhalf Caolan Blade -who has taken over at the Sportsground in the absence of the injured Kieran Marmion. With a "team in mind", much will depend on whether those players are available on Saturday, or next week when Connacht face Cardiff in what could be another season defining game, but Friend says there will be changes either way. "There will be changes because there are certain players we want to see, certain players we want to give a vote of confidence, and there are other things bubbling - next week we have to go to Cardiff and that is another big game." Friend says outhalf Jack Carty, who was hit with a late tackle in the 20-18 win over Sale, is likely to be rested this weekend, while flanker Sean O'Brien is not ready to return with his shoulder strain. "Jack has been immense this year, he's had a lot of game time. He didn't train on Tuesday, so we'll see how he pulls up. It is how we manage loads we have accumulated with certain players, and we'll be looking to give others opportunities." Connacht became the first Irish province to win in France when Warren Gatland's squad overcame Begles-Bordeaux in 1996, and Friend would add to Connacht's French legacy with a second win in France this season. "We know it is a massive game," he says. " We want to get the win and secure a quarter-final. Where we finish in the table, I don't know, don't care, but I know if we win, we will have a quarter-final spot." Friend insists that preparation this week is all about players executing on the field against a French side, that although unable to qualify, will be tough to grind down. "Our theme this week is to know and play our roles, it's not about Bordeaux. We need to know the job we do, what role we play, and then go and execute it. We have to be the best we can be, and if we do that, the result will look after itself. "There is no complacency from us. Most French teams wants to protect their home record, so we are up for a fight there." Connacht do travel in confident form, growing with every game. Last weekend's 20-18 win against Sale was rare - demonstrating a greater mental grittiness despite not playing to their best. Understandably Friend described the game as "bizarre", littered with some 29 penalties, the concession of a 17-0 lead, and Sale's failure to kick a penalty to win the game. 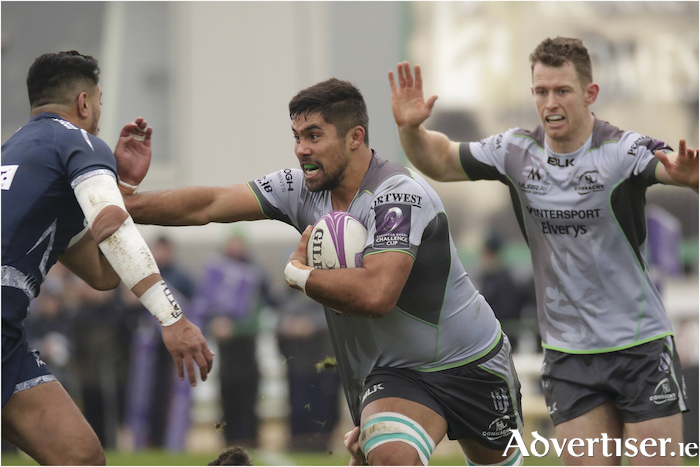 With minutes remaining Connacht were struggling to defend a two-point lead when they coughed up a penalty on the left 22m line. In frustration, Friend left the coaches' box only to discover Sale kicking for touch instead. And just as Connacht had conceded a penalty in the first half, Sale were stung for crossing in the line-out just metres from the Connacht line. Friend's frustration turned to surprise and then relief. "Surprised, I really was, because for me that's last chance saloon. You've got a crack at it, you've got international players there, probably all kicking at about 80 per cent, that's a pretty good roll of the dice, but they went to the corner, and a similar penalty that went against us in the first half went against them." Minutes before that final drama, Connacht had looked in control, winning a penalty on half way. Instead they failed to control possession in the line-out, and that, says Friend, is another learning in a growing list this season. "There were moments where I thought we could have controlled the ball better, and even right at the death. We've got to win that last line-out. We win that last line- out, we maul it and put the ball off the field, it's a dead rubber. But we lost it. So they are the moments we have to look at because in big games, and we want to be a team that gets into the Champions Cup, in a Champions Cup game you give that opportunity to an opposition and you are gone. Today we got away with it. "We are a side that wants to get into those play-offs in this Challenge Cup, but also want to be looking for Champions Cup, and they are learnings and we have to be better at those." Connacht enjoyed the better of the first-half action with outhalf Jack Carty opening his side's tally with a 12th minute penalty before a superb kick from Matt Healy gave the home side territorial control. After forcing a turnover, Bundee Aki drew the defence before slipping the ball to midfield partner Kyle Godwin, who caught the cover with his angled burst, touching down after 20 minutes, with Carty adding the extras. The home side's energy reaped rewards two minutes later, flanker James Connolly forcing a turnover in midfield, and scrumhalf James Mitchell was able to hack the ball downfield, secure possession, and race over for try number two. Carty's conversion put the home side into a 17-0 lead, but right on the half-time whistle Sale snuck in for a soft try from Chris Ashton after Denny Solomona broke up the right wing. Influential scrumhalf Faf De Klerk added the conversion, and although missing two kicks at goal in the second half, he put Sale into the lead with a try on 49 minutes, and two rapid-fire penalty kicks. However Connacht's replacements added impetus - Shane Delahunt was dogged at the breakdown, Caolan Blade upped the tempo, and replacement outhalf David Horwitz landed the game winner. Replacing Jack Carty who was hit hard with a late tackle, Horwitz struck the 72nd minute penalty that proved just enough to seal a deserved and dogged win over Sale for the first time. "Probably one of the more frustrating games to watch and to play, but at the end of the day, we've beaten Sale," said Friend. "It continues to build our belief. I think there is enormous belief of what we can achieve, our systems, and the way we are trying to play. It reinforces that - it's brick in the wall, and we will just keep pushing forward." Connacht v Sale: T O'Halloran, C Kelleher, K Godwin, B Aki, M Healy, J Carty, J Mitchell, D Buckley, T McCartney, F Bealham, U Dillane, J Cannon, E Masterson, J Connolly, J Butler ©. Replacements, Q Roux for Cannon (46 ), C Fainga'a for Masterson and C Blade for Mitchell (both 53 ), C Carey for Bealham (58 ), S Delahunt for McCartney and D Horitz for Carty (61m ), M Burke for Buckley (66 ), D Leader for Healy (70 ), Cannon for Roux (HIA 76m ).